The big fire at Rays Mill broke out just a few minutes after sunrise on a Sunday morning, April 25, 1915. The flames originated in the business district in a small store operated by Johnnie Clements, Jr. and soon spread to nearby buildings including the two story Rays Mill Hotel. The J.M. Parrish & Company store owned by Joseph Math Parrish was also damaged; bookkeeper at the store was Leon Lacy Parrish. At that time there was no water system in the town, and no way to effectively fight the blaze. One of the most disastrous fires in the history of Rays Mill visited that place Sunday morning about 6 o’clock. Several stores and considerable amount of goods were destroyed by the flames. The fire started in a store owned by John Clements of Milltown, in which building his son, Johnnie Clements, Jr., was operating a small store, and the store and contents were completely destroyed. The loss in this instance was about $1,000 on the building and about the same amount on the stock. There was insurance covering about half the loss. The flames leaped over a brick building and it was completely consumed [missing] & Co. and set fire to the Rays Mill hotel. The hotel was a two-story building and it was completely consumed by the fire. It was owned by Messrs. J.H. and Jas. S. Swindle and was valued at $5,000 or $6,000. The hotel was destroyed with most of its contents. Mr. J.F. Hineley, who operated the hotel, also had a small store which was entirely destroyed. The flames when the hotel was burning were so hot that the brick store of J.M. Parrish & Co. caught and was entirely destroyed. The building was valued at about $4,000 and the stock of goods was valued at about $15,000. The stock was largely the property of Mr. G.W. Varn, of Valdosta. There was insurance for about half of this loss. Two other store buildings belonging to Mr. Will Studstill of Valdosta were destroyed by the flames. These small buildings were valued at about $1,000, while the stocks of goods in them were small. It was impossible to control the flames as there was no water supply sufficient to cope with the fire and about all that could be done was to stand by and watch the different buildings burns and try to prevent any spreading. The losses are heavy ones and will injure the town materially. The total loss is figured at $23,000, and the total amount of insurance carried was $14,000, according to Mr. J.S. Swindle, who was in Nashville yesterday. Valdosta, April 26. – One-third of the business section of Rays Mill, a flourishing town fourteen miles from Valdosta, was destroyed by fire on Sunday. A number of merchants lost their stores and stocks and the Rays Mill hotel, a large two-story building, was entirely destroyed with most of the furnishings. The losses will amount to about $30,000, the property being partly covered by insurance. J.F. Hinely, proprietor of the hotel; J.M. Parrish & Company, John J. Clements, Jr., J.H. and J.S. Swindle and W.M. Studstill are the principal losers. The town has no water facilities and the block in which the flames started was burned before the fire could be checked. The debris has been cleared away and work on the new buildings which will replace those destroyed by the recent disastrous fire is progressing rapidly. With the completion of these new brick buildings, we will have what appears from the depot, almost a solid brick block, which we trust will be a reality in the near future. The J.M. Parrish Company’s store which was only partially destroyed, will be ready for occupancy again within a few days. This should be good news to all their many customers and friends, as they will have a new and complete line of general merchandise. 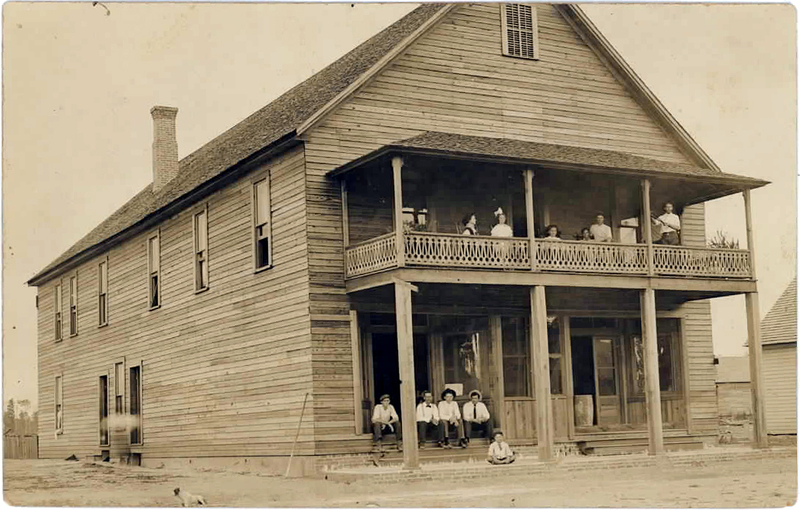 Jacob Fredrick Hinely operated the Ray’s Mill Hotel in a two story wooden building that was owned by James Henry Swindle and James S. Swindle. The hotel building stood in Ray City, GA where the Clements Fountain was later built. Hinely also had a small store located on the first floor right of the hotel. On Sunday, April 25, 1915, Ray City was ravaged by a fire that destroyed several buildings. A city block – nearly a third of the Ray City business district – was lost. The fire consumed the hotel and all of its contents, a loss of $6,000. The total damage from the fire amounted to about $30,000. Third of the Business Section of Ray Mills [sic], Near Valdosta, Burns. Valdosta, Ga., April 26 –(Special.) — A third of the business section of Ray Mllis [sic], a flourishing town fourteen miles from Valdosta was destroyed by fire on Sunday. A number of merchants lost their stores and stocks. And the Ray Mills hotel [sic], al large two-story building, was entirely destroyed, with most of the furnishings. The losses will amount to about $30,000. Partially covered by insurance. J.F. Hinely, proprietor of the hotel: J. C. Parrish & Co., John J. Clements, Jr., J.H. and J.S. Swindle, and W. M. Studstill are the principal losers. After the hotel burned, Jacob Fredrick Hinely and his wife, Laura Frances Hinely, remained in Ray City. Hinely took up farming. He was also listed in the 1917 Rating Book for Wholesalers and Shippers of Fresh Fish, Fresh Oysters and Shell Fish of All Kinds …. Hinely registered for the WWI draft at Ray City on September 12, 1918, his registration form being completed by C.O. Terry. Hinely was 43 years old, medium height, medium build, brown eyes with light hair. By the early 1920’s a boom period arrived in Ray City, GA and J. Fred Hinely was proprietor and operator of a beef market, one of the thriving businesses in the new town. He and his family lived in a rented house on Jones Street. While Fred ran the butcher shop his wife Laura kept house and daughter Thelma attended school. His son Theodore Hinely worked on his own account as an automobile driver, one of the automotive entrepreneurs of Ray City. The widower James T. Philips was a boarder living with the Hinelys. Their neighbors were Fred and Laura Tyler, and Katherine Swindle and her family. Later, by 1930, Laura and Jacob Fredrick Hinely left Ray City and moved to Jacksonville, FL were Hinely worked as a salesman for the Jax Steam Laundry.